Dining is somewhat limited on Emerald Star. There is only one restaurant, which serves three meals a day, as well as a lounge where you'll find a light breakfast and lunch and a half-hour tea in the late afternoon. If you get hungry at any other time, your only choice is a cookie jar in the pool area. There is no room service onboard. Other than at breakfast, meals never repeat and portion sizes are European (meaning they're reasonable, filling without being more than you need). Every night you'll find two appetizers, a soup, three main courses (one is always vegetarian) and a handful of desserts. 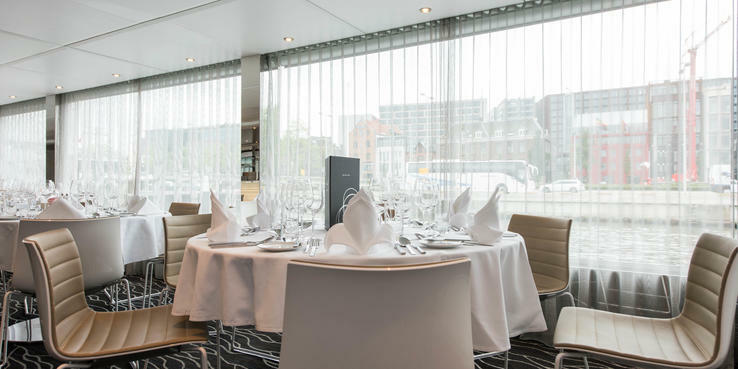 All the dishes have been created by a chef at the Emerald Waterways headquarters and passed on to the chefs onboard; they have no flexibility to add or subtract dishes from the menu. Whoever created the dishes enjoys combining flavors that are not typically found together, as well as whipped or "mousse" appetizers, soups and sides -- Champagne and mustard soup with strips of smoked salmon or peppermint sorbet with a blueberry topping, as examples of the former, and ham mousse and game cappuccino (a soup) for the latter. The success of the dishes varied, with some diners enjoying the eclectic mix and others not as pleased. (The rosefish with warmed tzatziki was resoundingly disliked.) We heard from several people who felt the menus started off strong and got weaker as the days progressed. Five "classic" dishes (a soup, appetizer and three entrees) meant there was always a more simple choice for those who wanted it. Diners with special needs are accommodated to a degree. So long as you let the line know ahead of time, you will be given a menu with dishes you can't eat marked. Sometimes (but not usually) an alternate version (vegetarian or gluten-free, for example) of a dish will be available. The most common complaint from passengers, according to the cruise director, is the noise level in the restaurant, which during dinner is so loud you often can't hear the person sitting across the table from you. Reflections Restaurant (Deck 2): The only restaurant onboard, Reflections serves a full buffet breakfast and lunch, as well as waiter-served dinner. Inside you'll find tables for two, four and six at breakfast and lunch, but only tables for four, six or eight for dinner. Breakfast service starts between 7 and 7:30 a.m. depending on the day's tour schedule. Available items include scrambled and hard-boiled eggs, omelets made to order, bacon and sausages, hash browns, cold cuts and sliced cheeses, fruit salads, yogurts and parfaits, pastries, cereals and porridge, smoked salmon and a variety of toast and bagel options. Gluten-free toast, muffins and cereal are available by request. Lunch hours vary depending on the day's schedule but can start as early as 11:30 or as late as 1:30 and always lasts an hour and a half. Also a buffet, the lunch menu changes daily and includes appetizers, a decently sized salad bar, soups, a pasta choice, main courses and desserts. Options might include asparagus and Black Forest ham, bell pepper and yogurt terrine, mushroom or tomato cream soup, rigatoni with vegetable Bolognese, fillet of cod, tofu ragout and lamb in tomato and onion gravy. The dessert selection always includes a cake, two ice creams and an array of international cheeses. One day per sailing, weather permitting, the crew offer up a top-deck barbecue with food inspired by the boat's location. On our Rhine River cruise we were treated to a variety of sausages, grilled turkey and vegetables, baked potatoes, potato salad and French fries. The open-seating dinner starts promptly at 7 p.m. As with lunch, the menu varies daily (no dish, other than "classic" choices, is ever repeated even if requested.) Appetizers might include farmer's ham wrapped in a pancake coat, chanterelle risotto or smoked trout, along with a soup choice. Main course options can include sliced roast beef, grilled fillet of cod with asparagus, eggplant escalope, whole roast of lamb and tandoori tofu. Dessert choices also change, though vanilla and chocolate ice cream, fruit salad and international cheeses are always available. Daily options might include yogurt and lime terrine, maple syrup mousse and eclairs with brandy sauce. Also available every night are five "classic" dishes: chicken bouillon soup, Caesar salad, rump steak, poached salmon and grilled chicken breast. Wines choices were not always regional -- French wines were served several nights (we spent most of the cruise in Germany), but on the evening we left Rudesheim they did serve a local Riesling. If you didn't like the wines on offer for that night, a handful of house wines were always available as well. Horizon Lounge (Deck 3): Emerald Star's only lounge doubles as a place to get an early bird breakfast, light lunch and afternoon tea. Breakfast in Horizon starts at 6:30 a.m and ends at 10 a.m. You'll find a small selection of cold cuts and cheeses, as well as pastries and yogurts. Lunch is available during the same hours as the Reflections' lunch. On offer is a smaller selection of the same items served in Reflections, along with some sandwiches. At 4 p.m. a tea is served in the Horizon lounge with specialty teas, finger sandwiches and small pastries.